Spring is in swing - you know what that means? Change! Let's switch things up a bit and create a positive change. Packing lunches, snacks and on-the-go meals and insuring your family gets a nutritious meal they look forward to is no easy assignment. 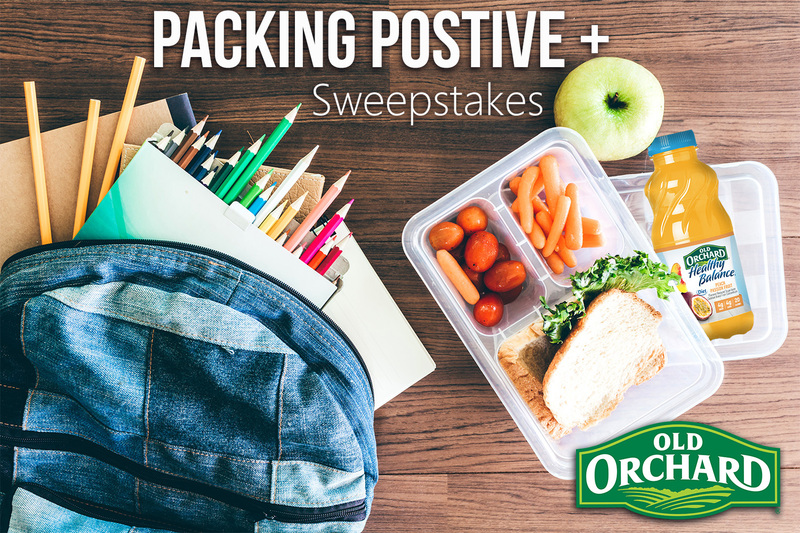 Packing lunches just got a whole lot easier with Old Orchard's new Healthy Balance Single-Serve juice drinks! 10oz of refreshing fruit flavor - without all of the carbs and sugar! A perfect size to take with you anywhere - school lunches, on a run, to the gym, or even on a road trip! Check out our Packing Positive post for 5 Tips on how YOU can become a packing pro! Old Orchard’s Best-Selling Juice Line is Now Available in Single-Serve! Packing Positive+ is our spring challenge for YOU! We would love to hear your healthful tips you use when packing your and your family's lunches! Share your best tips you use and you will be entered to win one of FOUR Grand Prizes! - Four 6-packs of our NEW Healthy Balance Single-Serve juice drinks - one of each flavor. What NEW 10oz Healthy Balance flavor are you most excited to try? What is your healthful tip for packing positive? Login or Join the Club for exclusive access.